I always get giddy when my husband decides takes the route down Main Street on the way home. Ive always liked the look of the old buildings and fancy street lights. A lot has changed through the years. Some of the buildings have been torn down and replaced by parks or pavilions. Christmas time down Main Street always brings back memories of the 70's. We lived in Belmont. Thanksgiving night was the night the town of Gastonia turned on the Christmas lights. Gastonia was about ten miles away. It was such a big deal. We piled up in dads Oldsmobile Station Wagon and headed up to Main Street. Its a small town with barely a quarter mile stretch, but as kid, it was ten miles long. The lights were strung across one side to the other. With the radio playing Christmas songs, cars would drive slow bumper to bumper. It was a big deal riding through the tunnel of lights. The cars would be full of kids with their heads hanging out of every window with smiles and wondering eyes. The town still decorates for Christmas but its not the same. Its sort of sad how the simple joys just dissapear as the world changes. 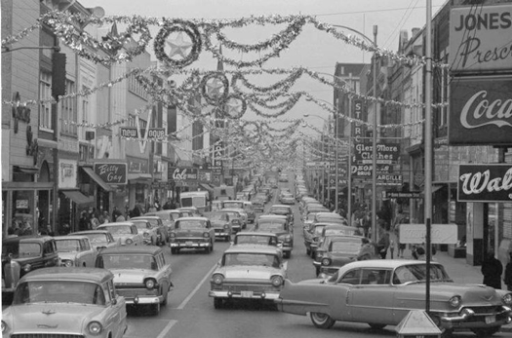 I found a photo of the town at Christmas from the 50's. I was not there but it looked the same in the 70's except for the old cars of course. I had to pull out my cell phone and snap a photo from the same corner as the vintage photo was taken. Looks like they kept the tradition for quite a while. By the 80's, its all started trickling away. It takes a lot more now days to impress a child. Oh how I miss those simple days. A sad change. I really miss when we lived in a community. Where I grew up in NYC our town did the same type of decorations on our main shopping street - as a child I used to get so excited seeing those lights and silver garlands! Nice post, Lisa - things were simpler back then, for sure. Merry Christmas to you! That must have been so nice to drive along under all the lights back then. Me too. Then I remember. I was lucky to see. to walk through those times. It is through your smiles that they still live. Oh yeah I can remember the cross street lights. It was a big deal to 'cruise main' at Christmas. The pictures bring back many memories. We would drive thru when driving to Shelby from Burlington, and Albemarle to see family. 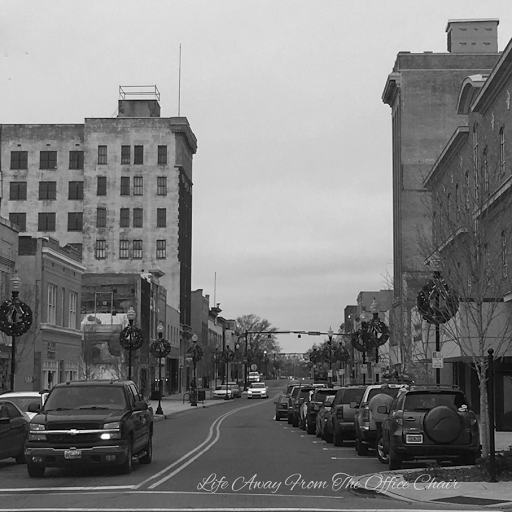 Yes it is a sad change... We moved to Belmont in 1954 Gastonia was a quick drive for sure. I can picture the drive down Main Street. There are small towns in South Alabama that still go all out during Christmas and it is gorgeous.